It is my pleasure to share this exciting news with you that renowned Joint Replacement surgeon, Dr. Bhushan Nariani is now a part of BLK Super Speciality Hospital. Dr. Naraini is a well-recognised specialist with over 16 years of experience in all aspects of Orthopaedics, ranging from general trauma surgery to complex revision Arthroplasty. Dr. Bhushan specialises in pain less Computer Assisted Navigated Surgeries for Joints. Prior to joining BLK Super Speciality Hospital, he was associated with Indian Spinal Injuries Hospital where his significant contribution paved way for the hospital being recognised as one of the centres of excellence for Joint Replacement in South East Asia. 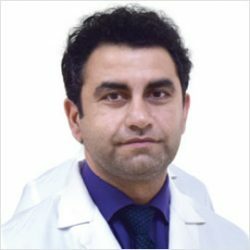 Dr. Nariani has received several fellowships in Joint Replacement & Arthroscopy from some of the most reputed medical institutes in the country as well as the world. He himself has been conducting 3 fellowships successfully, every year for the past several years. Taking this opportunity, allow me to share a few highlights of some of the unique features of our Institute for Bone, Joint Replacement, Orthopaedics Spine and Sports Medicine. Equipped with state-of-the-art-facilities and manned by experienced and highly skilled Orthopaedic doctors, BLK Institute for Bone, Joint Replacement, Orthopaedics Spine and Sports Medicine offers you a range of world-class treatment and services all under one roof. The Institute specialises in the treatment of musculoskeletal system disorders and also offers advanced Minimally Invasive Surgery (MIS) for Total Knee Replacement, Hip Replacement Surgery, Unicondylar (Partial) Knee Replacement Surgery as well as Replacement of Shoulder and Elbow joints. I also wish to share my heartfelt gratitude with you for being such a trusted patron. Time and again, your guidance and support have inspired us to push our limits to achieve greater milestones. I look forward to more successful years of our incredible association.